The doctor for Scruffy and his pals likes to jokes. Meet Dr. Sal. He was our sports doctor in high school for football, track and golf. I remember going to him for a physical exam my first year of playing sports. I had never been to a doctor for any reason other than being sick. The seniors on the team warned all of us guys that the hardest test on a sports team was passing the exam with Dr. Sal. They told us getting hit in the gut or having your fingers pulled out of joint were nothing compared to the physical that Dr. Sal would put us through. Needless to say, I was scared to death. Things went pretty well, though, as he listened to my heart, looked in my throat and ears. He even hit my knees and ankles with a rubber mallet that made them jump. I thought he was about finished checking me when suddenly he said, "wait right here, I need to get my needle." My heart leaped into my throat at the thought of getting a shot. 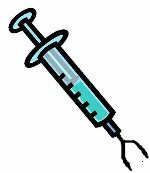 Then he walked back into the office yielding a huge syringe with a long protruding needle with a forked end and my heart almost came out of my mouth! I thought, "my sports career is going to end before it gets started!" "Holy crap, Doctor Sal! What are you going to do with that thing?" That was all I could manage to get my quivering voice to utter. He said, "I've got to check you for a hernia." I danged near fainted! The sweat started pouring down my forehead, as I gritted my teeth, clinched my fists and closed my eyes in preparation for what would surely be my last moments on earth! Dr. Sal started laughing and said, "relax Scruffy, it's just a joke!" Whew, I have never been that scared before or since. Besides being a practical joker and an excellent golfer, Doctor Sal is a gifted and caring physician. He built a successful practice treating sports injuries and doing reconstructive surgeries. However, he believes the best medicine is prevention. I had hoped he would share some advice on sports fitness, flexibility and exercise, but he explained to me that since he is now semi-retired, he doesn't keep up on the current improvements and techniques. But he offered to give us some links that will address these areas for improving your golf and physical fitness. And knowing Doc Sal, he will probably throw in a joke or two for your enjoyment. some recommended links from Doc Sal. Click here to go back to the Pals.